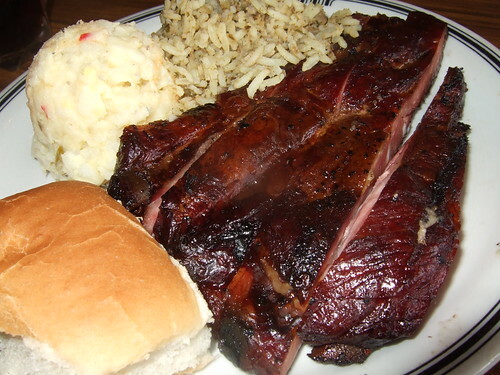 Top notch BBQ joint in deep Southeast Texas? Do tell. If a tree falls in the forest and there’s no one there to hear it, does it make a sound? Similarly, if a Texas BBQ joint is not listed in the yearly Texas Monthly BBQ issue, can it possibly make good BBQ? Questionable analogy, but you get the point. Until this past weekend I’ve never experienced a Texas BBQ joint that I felt was incorrectly left off the list. There are lots of middling BBQ joints in Texas. I also grudgingly condone TM’s central Texas bias with the 2008 top five all within a north-south corridor just east of Austin (Taylor, Lockhart, Luling, et. al.) generally referred to as the Texas BBQ Trail. So it was with raised eyebrows and watering mouth that I welcomed a surprise southeast Texas BBQ recommendation from my friend Jim Gossen, CEO of Louisiana Foods here in Houston. There are probably few people who have traveled the I-10 corridor between Houston and Louisiana more than Gossen. Having founded the Landry’s seafood restaurant chain with his Lafayette (LA) high school classmates Billy and Floyd Landry, Gossen and the Landry brothers would eventually pepper south Louisiana and southeast Texas with popular restaurants such as Don’s Seafood, Willy G’s, and Magnolia Bar and Grill. 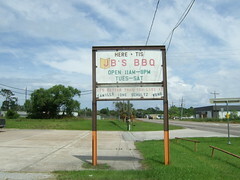 On a recent drive to Lake Charles I decided to stop by JB’s to check it out for myself. The restaurant is just off of I-10 but located in such a way that it is not easily noticeable when driving by. After a brief detour due to an incorrect Google map, me and fellow foodie/LC poker player @collierchin pulled in to JB’s parking lot. The joint was quiet on a late Saturday afternoon — we were the only guests other than a large group of locals occupying a private dining room. Gossen had specified that the brisket was the dish to get here. Certainly high praise considering that brisket is the cornerstone of the central Texas BBQ joints. Gossen mentioned they prepared the brisket in a special way that removed the chewy connective tissue and only left the most desirable collagen that breaks down into gelatin when slow-cooked. It’s this gelatin that is both flavorful in itself and drenches the meat in fatty, rich goodness. 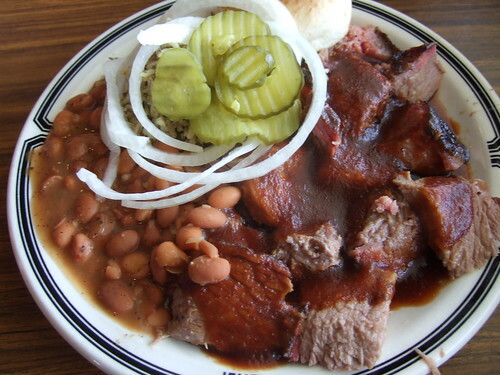 I ordered up a plate of brisket doused in BBQ sauce with beans and dirty rice, onions and pickles, and a dinner roll (nice substitution for the usual slice of white bread). After placing the order, the ceremonial slicing of the brisket commenced. I’ve stood in the smoke rooms of the central Texas BBQ joints and damn near saluted when I watched the pit masters slice the buttery brisket into thin, long strips, dump the result on to butcher paper, weight it, and hand it over to me. The traditional cross section of a brisket slice is of course: meat, smoke ring, fat cap. So it was with great interest and provocation that the brisket at JB’s is not sliced but rather chopped into chunks. Sacrilege you might think. But this plate of big brisket cubes drenched in an above-average BBQ sauce was oustanding. Some chunks were pure falling-apart meat, some a succulent combination of tender meat and buttery gelatin. There was not a stringy, tough, or dry piece in the batch. Gossen was right — this is Texas-class BBQ brisket with a southeast Texas twist. The side of beans was simple and flavorful and not mucked up with a lot of onion or bell pepper chunks. The dirty rice was on the dry side but still good. @collierchin got a plate of ribs and sausage. Both were excellent. Ribs were tender and tasty if a bit dry. Sausage was spicy and rich, with a finer texture than the chunky sausage you get at most BBQ joints. I have no idea if JB’s is going to make an appearance in the next TM BBQ issue. If it’s not included, it should be. 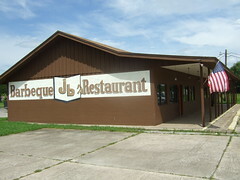 I highly recommend visiting JB’s BBQ the next time you are passing through Orange, Texas. This entry was posted in Barbecue, Blog Only, Food, Gulf Coast, Restaurant Reviews, Texas, Travel and tagged barbecue, brisket, orange texas. Bookmark the permalink. Sounds like in those chunks of brisket you probably got some burnt ends. As a foodie, you might know what those are, but most Texans and Texas BBQ joints don't. They're popular in some of the Kansas City BBQ joints, and are awesome. It's basically the burnt points of the brisket, and are ususally chopped. I'll have to check out JB's next time I get down towards Houston. Good review. Try the dirty rice with the sauce on it and a couple of their jalapenos. Makes the dirty rice great.